The DD Hammocks Jungle Hammock with the waterproof weather shield installed underneath and the tent poles inserted. The DD Hammocks Jungle Hammock without the tent poles resembles nearly any bug net hammock. The weather shield is on top but has been pulled to one side to show the netting. I love getting surprised by a hammock. You might assume that there isn’t much to change about a hammock, especially a gathered-end hammock—a style that has been around for millennia. However, sometimes it’s just a subtle change that has a dramatic difference. This is my first hands-on look at the DD Hammock line and I’m pleased to say, I’ve been comfortably surprised. MSRP £119.00 (US$196) Fast 2-day shipping is included in the pricing. *Includes double-layer hammock, attached bug netting, and whoopie slings. I requested a sample from DD Hammock to wrap up some hammock research I’ve been doing and I thought I would write up a quick review on the model they sent—the DD Hammocks Jungle Hammock Modular System. First off, the shipping was remarkable. When I was notified the package was on its way, I expected international shipping to take at least a week. The hammock arrived the next day from the UK to Flagstaff, Arizona, USA. The DD Hammocks website states all orders are shipped within 1–2 days and I can attest that this claim is valid. The Jungle Hammock is the latest in a line of hammocks and related gear offered by DD Hammocks. There are two versions of the Jungle Hammock, with one having a double-layered hammock body. The double-layered bottom provides a more bite-proof protection against mosquitos and other insects, plus the layers separate on one side (thanks to some patches of hook-and-loop fasteners) to accommodate a thin sleeping pad, reflective layer, or other insulation. The hammock has a large military-grade YKK perimeter zipper (a total of four zipper pulls) that allows entry on either side of the hammock. 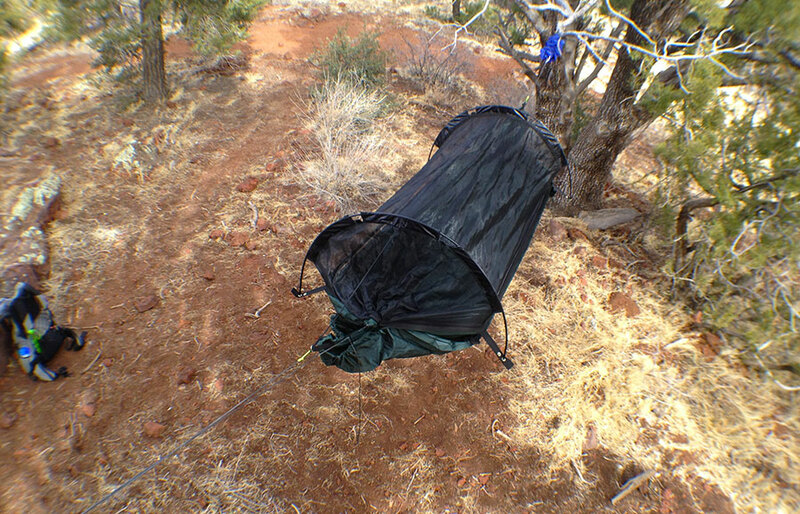 The bug netting can be completely removed, but the dimensions are generous enough (it isn’t a fitted net like the Hennessy or Warbonnet models) so that the hammock can be turned upside down for net-less sleeping. The bug net can also be removed on one side to allow for quick exits, if necessary. 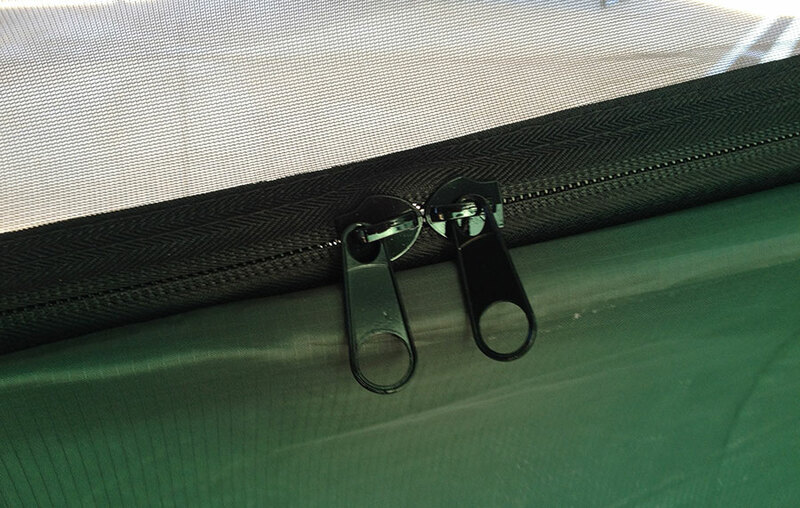 The netting also has pole sleeves on both sides that accept collapsable aluminum tent poles (the poles are included). The design reminds me a lot of the Clark Jungle Hammock line as well as the Lawson Hammock. In addition to the double-sided bottom, the hammock includes a weather shield that wraps around the under side of the hammock. This waterproof layer cuts down on convective heat loss, water splashes, and sideways rain that may get under a smaller tarp. 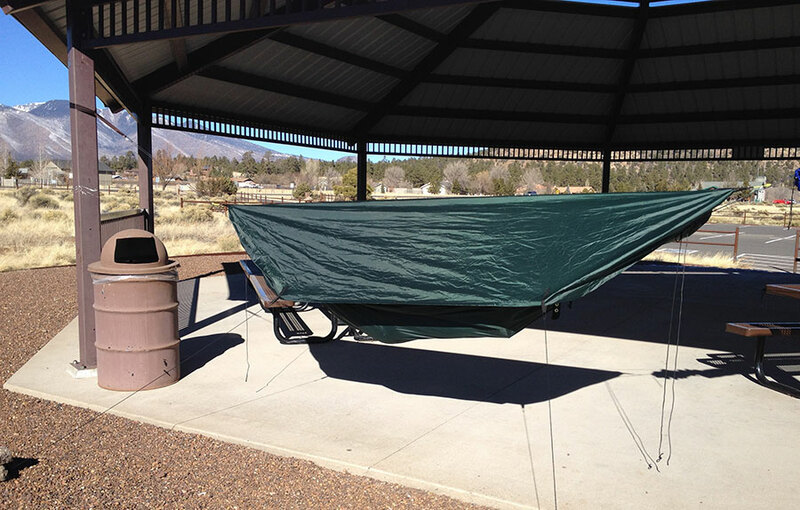 DD Hammocks refers to this model as modular because the weather shield can be used as a ground sheet if the hammock is pitched as a tent, or it can be used as a narrow tarp to cover the top of the hammock. The weather shield deployed as a tarp but without the tent poles. This configuration offers the most rain coverage with the weather shield. 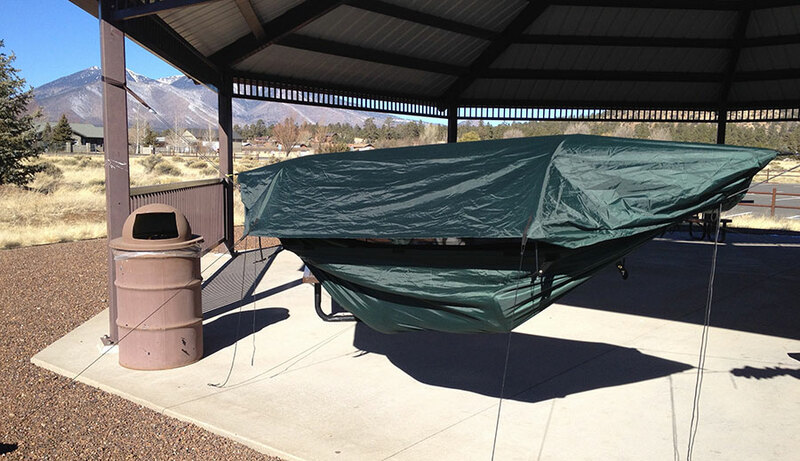 The tarp is connected directly to the hammock suspension lines. With the tent poles installed, the weather-shield-as-tarp is elevated above the hammock and exposes the sides to more sideways rain. The coverage is adequate for moderate storms. There is plenty of coverage on the ends. Showing how I used a Klemheist knot to connect the tarp directly to the hammock suspension. I use a split keychain instead of a carabiner because the keychain provides a failsafe mechanism to ensure the tarp isn’t pulled too hard that might cause damage. You’ll also note that I connected the elastic ridge line to this point as well. When used as a tarp, the waterproof cover makes the Jungle Hammock resemble the Lawson Hammock more distinctly with its fitted tarp design and wrapped ends. I connected the tarp directly to the hammock suspension and I found that it provided adequate coverage when the tent poles were installed. Without the tent poles, the tarp provides a little more side coverage, especially when guy lines are used. NOTE: The tarp doesn’t include any guy line, but there are four guy points that can be used to stake down the tarp. 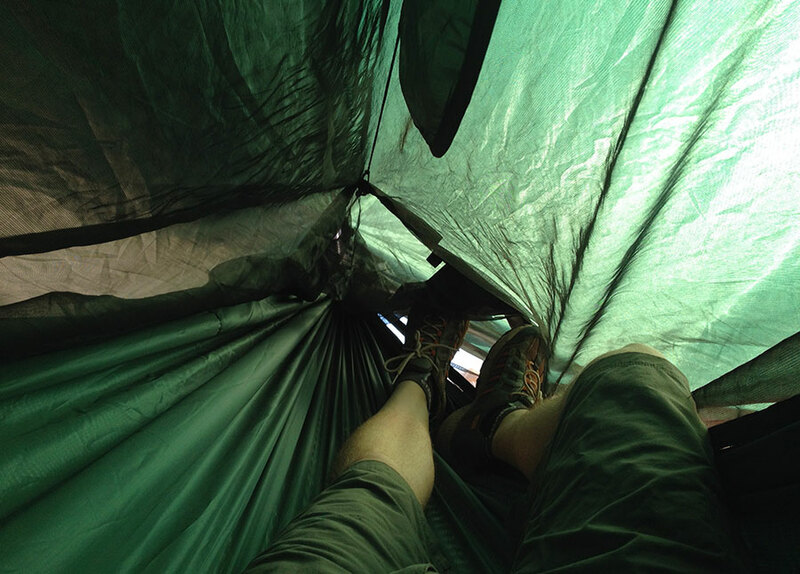 The tent poles (aluminum with shock cord) are not required to pitch the hammock. Indeed, if you want to save some weight, one or both poles can be left at home. 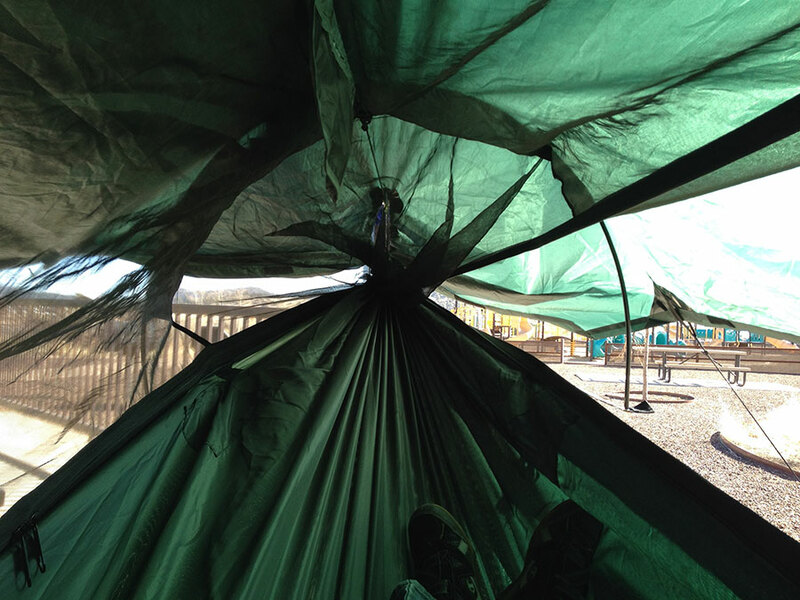 The poles do expand the space inside the hammock dramatically. I found that I can live with just one pole to expand the head area and leave the foot end floppy. Showing the foot end when there is no tent pole installed. With the ridge line, there is still ample room. Showing the foot end with the tent pole. Notice the increased visibility as the tarp is pulled out higher from the hammock. 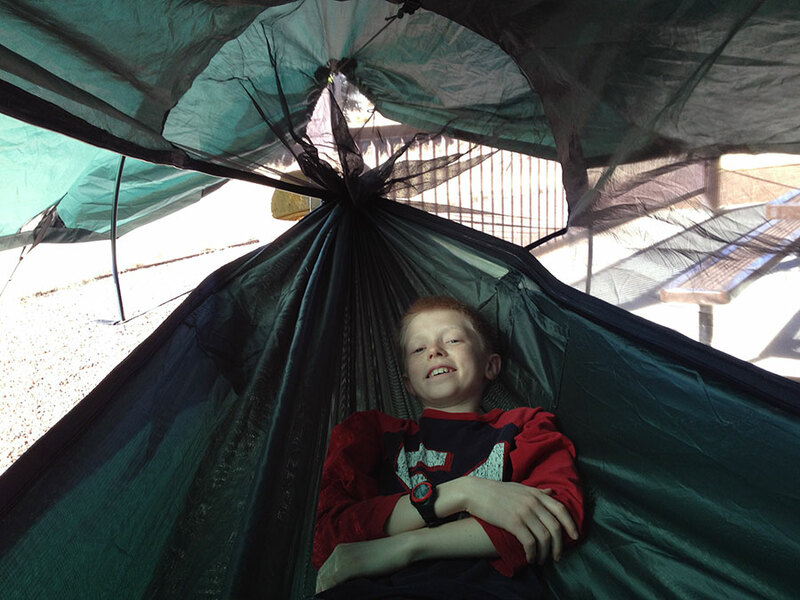 My son posing in the hammock with the tent pole installed. He loved the additional head room and remakes that he could “easily read a book” in this hammock. 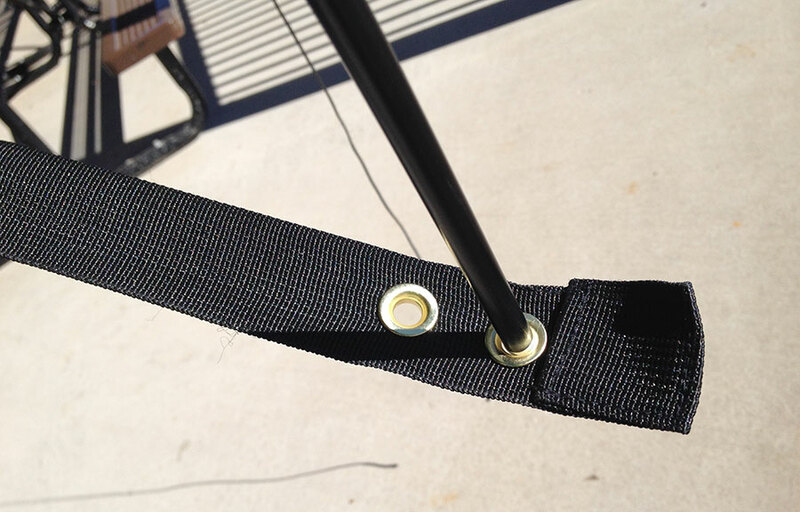 The tent poles connect into some grommets that are punched into wide webbing straps that extend outside the width of the hammock. There are two grommet holes on each strap stub, and I’m not exactly sure why this is necessary. I used the outer of the two grommets to set up. 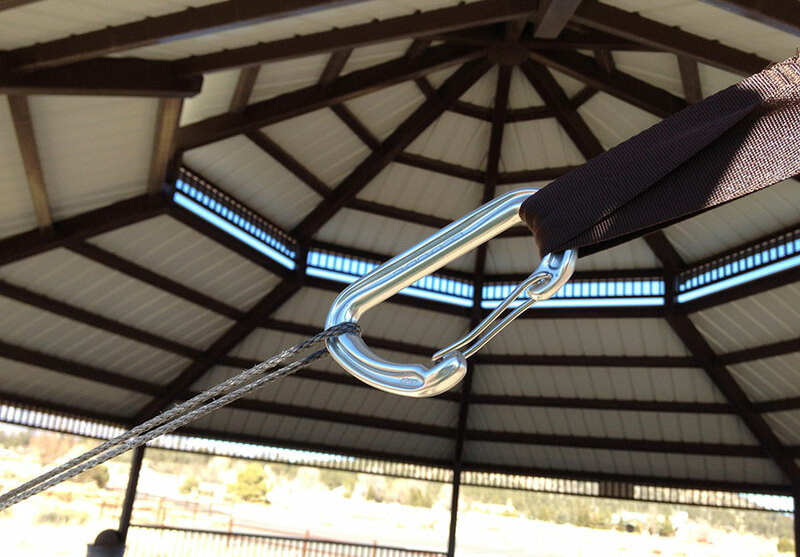 The poles help spread the hammock open, like a spreader bar, but still flex enough to allow for a diagonal lay. With the poles, the hammock can be set up easily as a one-person bivy shelter, although I would recommend using a small ground cloth such as inexpensive Tyvek or a plastic sheet. The Jungle Hammock is one of the only commercial hammocks I’ve seen that uses Dyneema Whoopie Slings. 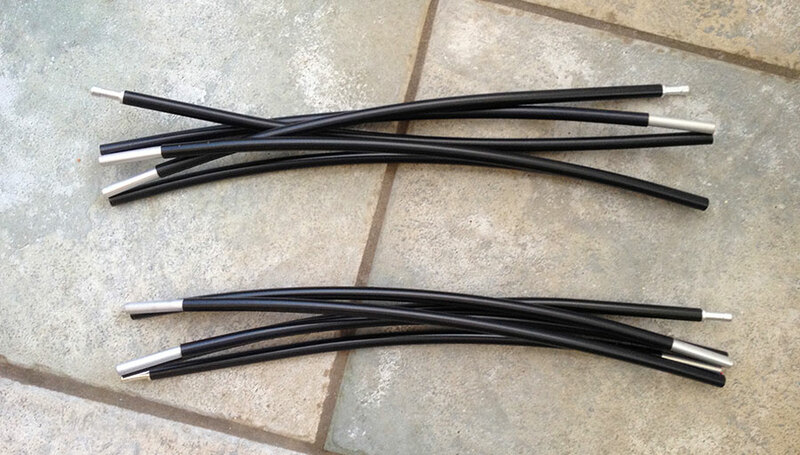 This style of suspension is very popular with do-it-yourself hangers and those looking for a lighter system. Whoopie Slings aren’t difficult to master, but they do have a learning curve for the uninitiated. The suspension also included a pair of professional-grade, full-size, climbing-rated carabiners and webbing straps. This is a professional suspension set. Inside the hammock there is a ridge line, of sorts. 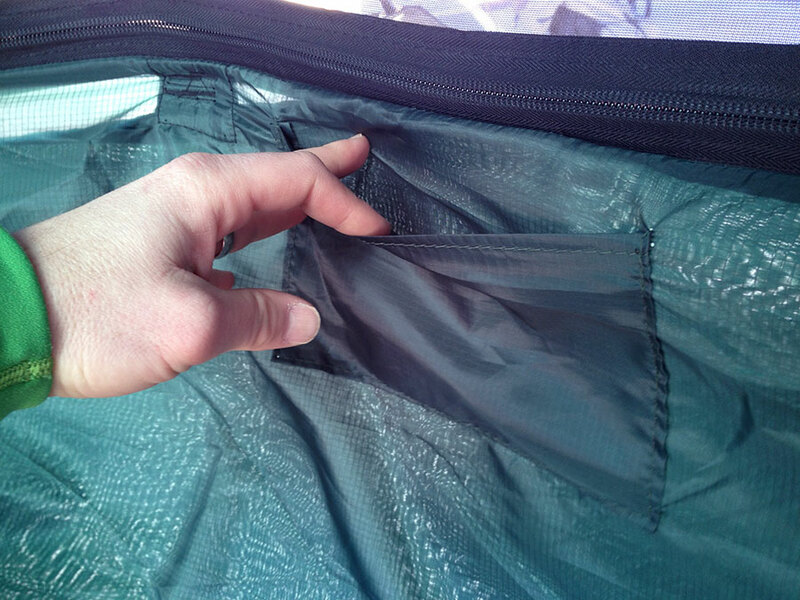 A string is tied to loops that are sewn where the tent pole sleeves are located. But in order for this ridge line to work, it needs additional line on the outside of the netting to pull the netting apart. The hammock comes with two lengths of shock cord that serve this purpose. I had to re-tie the ridge line and install the shock cord before it was usable. Hanging on the ridge line on the inside is a pocket organizer, similar to what you might find in a Hennessy Hammock, although slightly smaller. Since the ridge line isn’t ridged (due to the shock cord on either side), heavier items such as my iPhone, make the organizer sag down a little. 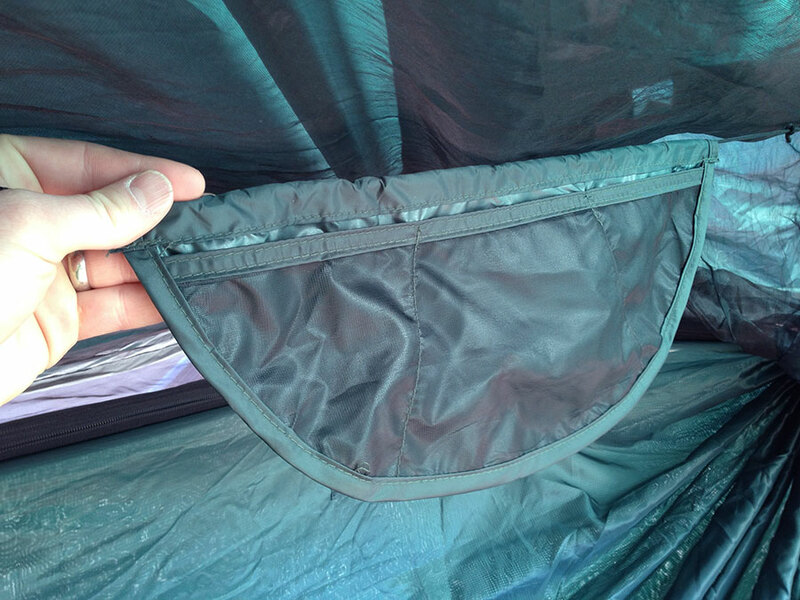 Located on all four corners and sewn into the hammock body are small pockets. My iPhone easily fit inside these pockets and was a better choice for this heavier item than the ridge line organizer. The ridge line isn’t entirely necessary to pull the bug netting off the occupant, although it does serve to keep the netting from being pulled apart. This isn’t a high concern because of the use of shock cord instead of line on the outside. The shock cord is actually a nice touch because it means I can reach over the bug netting to make adjustments and the netting will pull away without ripping thanks to the elasticity provided by the cord. I was pleasantly surprised at how comfortable this hammock was. I know what you’re thinking—aren’t all hammocks inherently comfortable? Nearly. Depending on how the hammock ends are gathered or folded, the size of the material, and the ridge line length, there are differences in how ridges are formed that can strain knees and hyperextend legs. A few hammocks feature “foot boxes” that help shape the foot area to alleviate hyperextension. The DD Hammocks Jungle Hammock solves this in a different way. I didn’t have any “ridge” under my legs and has a nice pocket for my feet and head and the lay feels flatter than a standard gathered-end hammock. I think this is due in part to where the tent poles are located and how they pull out the fabric in just the right locations. The tie-outs (where the tent poles are attached) are in the right location—right where my feet meet the edge of the hammock. This means the fabric is pulled away from my feet instead of intersecting them, as it does on other hammock models. The headroom is sufficient without the tent poles and is absolutely spacious with them. This is a good hammock for new hangers not necessarily worried about being ultralight, but who are also looking for an affordable all-in-one kit. The price is great for a hammock that comes with so many features, including a premium suspension system and a modular weather cover that can double as a tarp. Including the shipping in the price makes this hammock an easy choice when compared with other models. The tarp/weather cover is “just enough,” but most folks will probably want to pick up something with more coverage. The design is very well-done, especially considering how well the components work together, how comfortable the lay is, and the considerations for storage and packing. The Jungle Hammock strikes a really good balance between mid-range fabrics and notions (and some top-of-the-line components) with a high-end design and functionality. Installing the ridge line, the shock cords, and tying up the ends of the bug netting are all necessary but left to the user to complete. I wish the stuff sack had a button hole or was double-sided so I could use it as a quick-deploy sack in the field. If there is one mod I’ll make soon, it will be to punch in a grommet in the bottom of the sack to convert it into a Bishop Bag. Hi there, I was looking at the lawson and this but can’t find any vids with then being used during heavy rain, have you had any experience, I am new to this all and eventually want a Clark NX-250 but in the mean time I am looking for cheaper alternative I plan to hike around Scotland’s national parks so could you recommend a thermo mat? Thanks, and great blog excellent reviews. Lots of great questions, Mark. 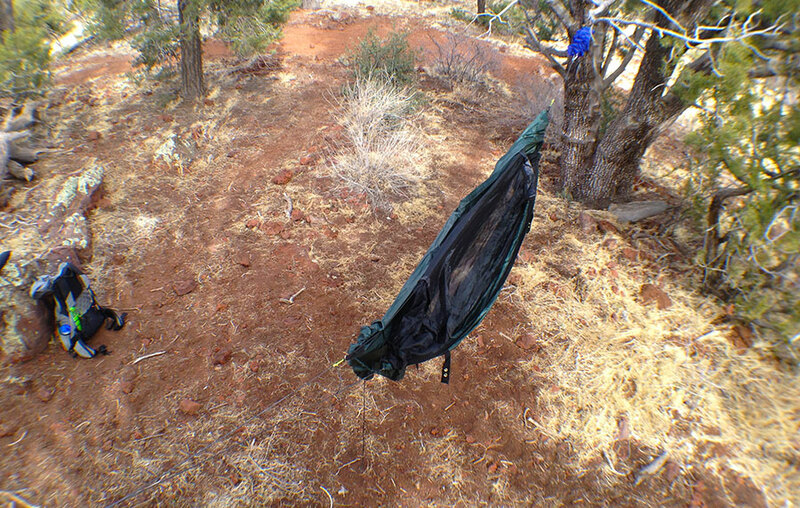 The DD Hammock will be lighter and more suitable for backpacking than the Lawson, and shipping will be cheaper too. If you know you will be encountering a lot of rain on your trip, you might invest in a bigger tarp. In my own experience, the DD Jungle Hammock’s tarp/weather cover would do fine, especially if you leave the tent poles behind. The tent poles pull up the tarp and expose the under side of the hammock more. This isn’t a huge deal in some situations, but if you can’t get a good site that is somewhat protected from the wind, you might get some sideways rain issues. A good tarp alternative for less is the Ticket to the Moon diamond tarp. I think the DD Jungle Hammock is a good competitor to the Clark NX-250. As for insulation, are you looking for a cost-effective (less expensive) solution? For most 3-season camping down to 0°C (32°C), most people can get away with a closed-cell foam pad. I like the military pads because they are wider (most pads are only 20 inches wide vs 24 inches for the GI pad). The widest pad that I recommend for hammocks is the wide Thinlight Pads from Gossamer Gear. The double-layer DD Jungle Hammock is a great option to hold a pad in place, but isn’t necessary. If you want to save a little more weight, go for the single-layer. I purchased the DD Jungle Hammock after reading what you had to say plus other reviews, also purchased the under blanket for the hammock and have purchased a Vango 900 ultralite sleeping bag. I am Looking at different tarps.. Will decide in a few days which to get, my hammock will be here tomorrow 🙂 going to take it out Wednesday after few test runs tomorrow/Tuesday. I am 6’4″and go 275lbs, obviously I am American 🙂 (based on units of measure) and am interested in how this system accommodates a gentleman with my frame, I am not fat, just very wide, lots of protein heavy lifting and such. I am yet to find a system that could comfortably accommodate me, but this one looks promising, any info would be appreciated. I think you would be fine, so long as the listed weight capacity for the hammock meets your needs. For cold weather, i recommend an Underquilt, rather than a thermo mat. For European customer, http://haengemattenshop.com is a good place to shop DD hammocks. They also have the more expensive, but in my opinion better Hennessy hammocks in their inventory. I’m looking at a DD or Hennessy deluxe. Absolutely no experience and wondered what you would choose? DD has amazing prices if that is a drivingfactor. I think Hennessy has a little better quality. What other factors are important to you? Price is always nice but I can wait a bit and increase my budget. I’m after adaptability. One hammock for all situations. I’m not likely to be jetting off to the amazon or artic tundra (uk based) so it would be all seasons but temperature ranging from summer sun on engliah south coast/dartmoor to Scottish Highlands. I’ve got a snugpak jungle bag with built in mosquito net already but will not say no to a canopy as I like the extra sense of personal space. Thanks for the quick reply by the way. If you want versatility, go with the DD, as it makes a pretty good bivvy tent pitched on the ground; something that is difficult with a Hennessey. The difference in price is about £60 although it would seem it is cheaper to buy the DD in the States(!) as here in the UK it is £109 for the single layer and £119 for the double. The DD claims to take larger weights and comes with (in my opinion) a better suspension system. You can save yourself some pennies and get a better and more versatile shelter (again in my humble opinion) by going for the DD Travel Hammock/Bivi (it has a waterproof base) and a 3×3 metre tarp. Total all-up weight of about 2Kg (4.5lb). I was very disappointed with this product. I tried setting it up in back garden and wasn’t convinced. Took it out in the wild the following night and it split right across the middle. Its only 1 skin if you want the tarp and feels very flimsy. OK. if you’re out in the jungle, you wont need the 2nd skin so as to insulate in between. However, I don’t believe this product is man enough for an outdoor adventure hammock. I emailed my disappointment to whom I bought it from on line and they haven’t given me an explanation which adds more sour grapes. My 1st DD hammock was great but this thing is, in my opinion, very poor and a waste of money. Apologies for the negativity but there you go!! Hi Derek, thanks a lot for this Web page and your book. With a group of friends we are fostering some humanitarian activities in the Amazon rainforest since four years ago. This very year we are planning to go deeper into the jungle through one of the affluents of the Amazon river in Peru. We are considering to try hammocks but all of us are newbies with them. The DD jungle hammock is one of our candidates, but there are also the Clark TX 270 (much more expensive) and the HH jungle safari. As we will spend a minimum of 15 days an a maximum of one month (august) sleeping and living on it, which one would be your first choice ? Thanks a lot in advance for your answer ! I would go with either the DD Jungle or the Hennessy Deep Jungle series. Both are lighter and pack smaller and will save you some funds. I’d upgrade to larger tarps on both just to give you more flexibility in shelter options. Derek, good review. My 1st question is what is your size height & weight? I am new to hammock & this one is smaller than most of the competition. i am 6’1″ & 190 lbs. & I am going on a camping road trip out west (US national parks) The DD’s impresses me & I wonder if I can use this rather than their XL. thanks again for the thorough review. I’m 5’10” and 175 lbs. This hammock should fit you well. Hi Derek, thanks for the review. Do you think we can change or add another ridge line and place it from end to end of the hammock (attached to the suspension loops), just like HH or any other regular gathered end hammock? Thanks! The DD Jungle Hammock has a ridgeline. You can modify it if you want. I am 6’0″ and 265 lb (yeppers, I is a big girl!)…Lol! But I ordered the DD Frontline XL hammock and with the Rallt suspension system (rated to1000 lb+) and Rallt carabineers I am perfectly comfortable and SAFE! It’s also more affordable than the jungle hammock. With the money saved, I bought the 4m x 4m lightweight tarp. Totally awesome set up for the money! Also, check out the kellykettle.com site for the ultimate “cooking” stuff. And ALL of it fits in the bow of my kayak. Adventure awaits! Any opinions on the (relatively) short length of 2.7m (<9'), and how that affects comfort vs, say, Dutch's new Chameleon (at 11')? I like the price and modularity of the DD, but not having a lot of experience with various hammocks, am leery on the short length. In my use of the DD Jungle Hammock, I didn’t find the length a problem. I think the poles help with that. I’m just getting into the hammock camping scene for multi-day backpacking, spring through late fall in the Rocky Mountains (Colorado/Wyoming). In particular, I was looking for a hammock system similar to this, with the expanded utility of being able to set it up as a bivy when trees aren’t in the immediate area. I’ve narrowed my choices down between this and the (much more expensive) Clark Mark2 and wanted to get an opinion on what I would be paying for with the extra I would shell for the Mark2, as well as get an opinion on overall cold weather rating for DD Jungle Hammock. I’m seeing a lot of 3 and 4 season tags being applied to these, and based on what I have been able to glean, I can’t make heads or tails of these ratings as these do not appear to have any intrinsic insulating value to them. This is a product I would be using 16-20, 2-3 day weekends out of the year, and I want to make sure that my purchase will hold up for under those conditions. If I were backpacking, I would select a much lighter system. Even the DD hammock here or the Clark Mark2 are fairly heavy when it comes to hammocks. ANY hammock can be pitched on the ground if it comes to it. In fact, I would opt for a more modular hammock so you can pick a better tarp for your needs and then use a hammock underneath. The DD and Clark are great systems, but they are a kit. I would recommend something like a Warbonnet Blackbird or Dutch Chameleon hammock for a jungle hammock.